A rambling discourse on food, cooking, restaurants and other edible topics. This is one of my favorite dinners ever. EVER. It is tasty and delicious but yet it feels fresh when you are eating it. It is fast and simple to make, and you can vary it depending on your mood. Need I say more? It all came about one day when I was planning on having the kids make their own sushi. I had prepared the rice and all the toppings that the kids like (salmon, cucumber, and avocado) when I realized that I was out of seaweed. 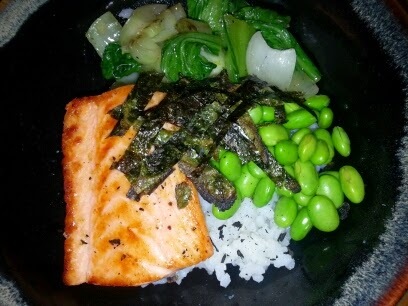 So, I told the kids we would have sushi in a bowl and that is exactly what we did. Which is when I realized that sushi in a bowl may actually be better than sushi sushi. At least when prepared at home. I would love to say that I invented this dish, but no, the Japanese actually already figured it out. They call this kind of dish donburri, which literally means bowl in Japanese. First let's talk rice. You will need to have sushi rice, which is a short-grained rice which has some stickiness to it. If you get, for example, a Chinese rice, which is medium grained, you will not have sufficient stickiness to make good sushi. In California, you are spoilt for choice because sushi rice is grown there. Here in Sweden, I just get the brand that is sold in every market in the international section. This is my favorite type of rice and I serve it with everything, unless I am specifically wanting a different texture. Now, here is the trick that turns a bowl of rice into sushiness. Ready? Seasoned rice vinegar. Sprinkled liberally into the hot freshly cooked rice and then tossed until it is fully incorporated, rice vinegar adds salt, sugar, and a touch of acidity which makes the rice extra delicious. Make sure that you buy seasoned rice vinegar. If you are unsure, check the ingredients list. If it containes sugar, then you are good. I let everyone sprinkle soysauce on, to their taste. To be honest, the rice tastes so good with just the vinegar, you barely need soysauce. When buying soysauce, the best kind is feremented and brewed naturally. Modern techniques have allowed soysauce to be made more quickly using hydrolyzed soy protein which also allows it to have a longer shelf life but tastes a bit different. While we Westerners tend to think of soysauce as a single item, there are dozens of different types of soysauce which vary in thickness, sweetness, and saltiness. 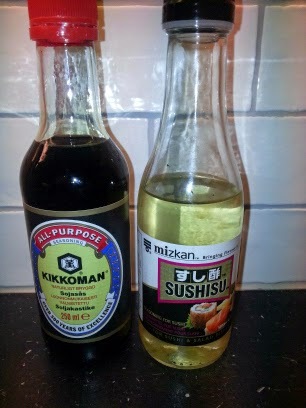 For a reliable soysauce, I always buy the Japanese Kikkoman brand, which is traditionally fermented and brewed. Let's talk fish. Any kind of fish would taste great in this dish. 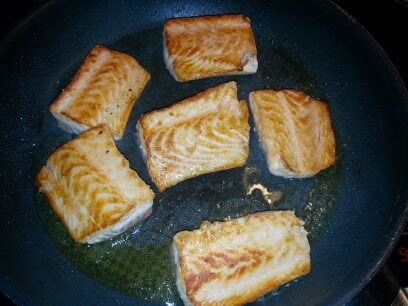 I tend to use salmon because that is the easiest to get here in Sweden. 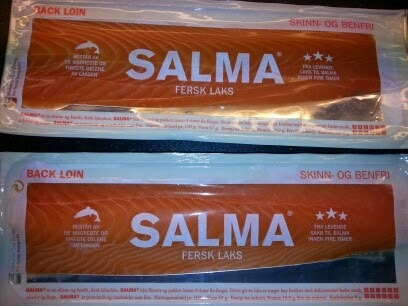 While any good salmon will be delicious, if I can get it, I buy Salmalax. This is salmon that has been processed within four hours from catching it. It is beautifully butchered into perfect pieces with no bones or skin and tastes clean and fresh. 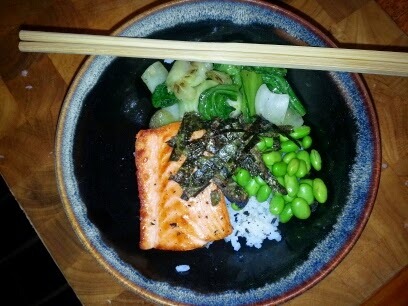 So when I want to do a raw salmon preparation, or seared, as I like for this dish, then Salmalax is perfect. It is more expensive but I think the results are worth it. Last but not least, what kind of additional toppings go on the rice? If I am really in a hurry, I just peel and slice a cucumber and an avocado and I am done. But if I have a bit more time, I like to add soybeans. 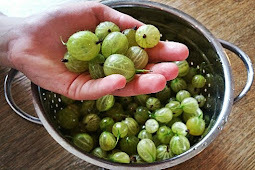 These beautiful little green gems taste delicious and are easy to do. Why? Because they are sold pre-cooked and frozen. This is one vegetable that is not better fresh because the raw bean is actually toxic. You just grab a box of these from your freezer, throw them in a pot of water and bring it up to a boil. Drain, sprinkle with some seasalt and you are done. cabbage is my number one choice, if I can find it. 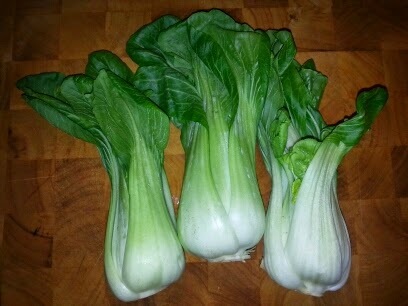 But otherwise, any green like spinach, kale, or cabbage will be equally delicious, stir-fried quickly with some garlic. Green beans or broccoli are also delicious cooked this way. The last touch is to add some seaweed to the dish. I like to get seasoned and roasted seaweed, which I then cut into small pieces. Even in Sweden, you can sometimes find this sold as a little snack packet. If I can't find that, I mimic it by brushing sheets of sushi seaweed with a bit of oil, sprinkling some salt and then searing it for a second or two in a hot pan. It is definitely not necessary, but my kids love it, so I try to get it if I can. Phew! That is a lot of explaining for a dish that is so easy to make. Put the water and rice in a pot with the lid on. Bring the water to a boil and then turn down the heat to the lowest possible setting on your stove, and leave it to cook for 20 minutes, by which time it should be perfectly done. Take the pot off the stove and shake in some rice vinegar. Start with two or three tablespoons, and then toss the rice with a fork to incorporate. Taste and add more vinegar if you like. While the rice is cooking, prepare your other ingredients. 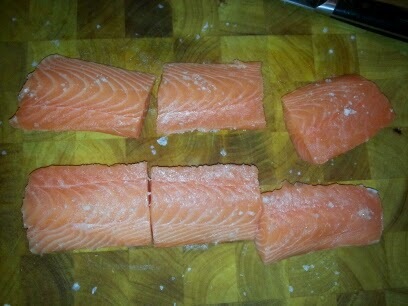 Cut the salmon into 4 to 6 pieces. Rub each piece with salt and pepper on both sides. Heat a pan to very hot. 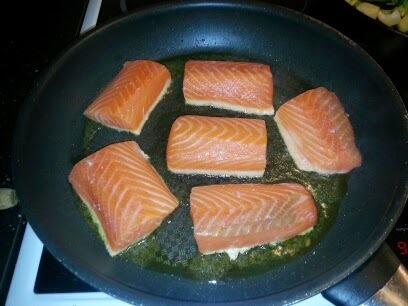 Add a bit of oil to the pan and lay in the salmon. The fish should sizzle when you lay it in the pan. If it does not, the pan is not hot enough. If you want the fish just seared, then lay it in the pan for not more than a minute and then flip over for another minute. The fish (depending on the thickness of the piece) should be raw in the center. If you like it more well done, simply cook it for longer. Take a packet of frozen beans, normally about 250 grams. Cook as per the instructions on the box, i.e. 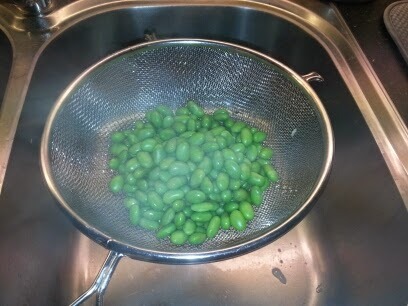 by putting the beans in water and bringing to a boil. Drain and then sprinkle with sea salt. Slice 4 cloves of garlic. Slice whatever greens that you have chosen into bite sized pieces. For example, spinach can be cooked whole but kale should be chopped up. Put a cup of water to the side of the stove. Heat up a frying pan to very hot and put some oil in it. 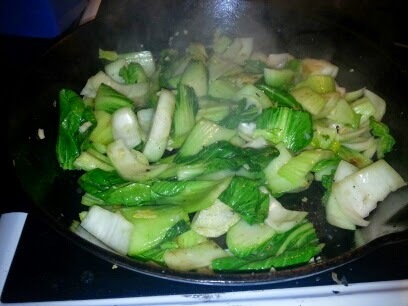 Throw in the garlic, stir once, and then immediately throw in the greens. Season with a bit of salt. Stir and cook until the vegetable start to take on a little color, making sure that the garlic does not burn. If you feel like the garlic might start to burn, throw in a bit of water in the pan. It will start to evaporate immediately, steaming the vegetables. Continue to add water until the vegetable is cooked to your liking. Spinach will need little, if any water, while green beans will need quite a lot to become tender. To serve, put a portion of rice in a bowl. Arrange the toppings on top. Sprinkle with soysauce and seaweed, if desired. Eat heartily because it is as healthy as it is delicious!